Mr. Delius, you were among those who attended the 25th Sudan Conference in Hermannsburg*. Is there any news regarding the relationship between Sudan and South Sudan? The violent clashes in Darfur, South Kordofan and the Blue Nile regions were the main topic of discussion at the conference. Sudan is accusing South Sudan of supporting the militant SPLM-North organisation. There is some dialogue between the two states, but the question remains whether the signed agreements, most of which were only reached due to pressure by the international community, will suffice to stabilise the dire situation and to offer a perspective for the future. Highly debated and criticised was the fact that the existing agreements only regulate the issues regarding the oil dispute. Of course this issue is of major importance to the economy of both countries; many other points, however, remain unsettled. Yasir Arman, leader of the South Kordofan-based SPLM-North, was another attendee. How does he view the situation on the ground, as well as the killing of the Nuba peoples? He has a clear picture of this horrendous situation and of the inadequate provision of basic services for the people within the conflict zones. He addressed the issue of the many civilians, who are being attacked in their villages- even churches and hospitals via aerial bombardments. The SPLM-North calls for a dismissal of the Sudanese government under Omar al-Bashir. In return, the Sudanese government’s aim is to crush the SPLM-North. In light of these extremely difficult circumstances, it is tremendously challenging to evaluate how to best shield civilians from the conflict. Both sides are sworn enemies. What we are dealing with are two parties that are fighting for the termination of the other’s existence. Hence, it is very problematic to find a compromise. The prosecution of potential SPLM-N supporters and the role of the Abu Tira (Central Reserve Police) surely play a significant part as well? This was one of the major topics at the conference. The Sudanese government operates by means of different units in South Kordofan. They establish militias, which massively target alleged or actual SPLM-N supporters. Yasir Arman also discussed Sudan’s marginalised regions; Darfur in the East and the North as well, where small-scale farmers suffer from extreme losses of land. Arman accuses the government of not caring for the needs of its own citizens. Sudan must become a more democratic country. This is what the SPLM-North fights for. Sudan’s external debt mounts up to a sum of $44 Billion Dollars. How big a part do oil exports play in the ongoing conflict? The reduction of its debt is absolutely vital for Sudan in order to attract new investment, which the state needs to become less dependent on oil exports. This dependence in particular, is the cause for many of the escalating tensions. In the past, Sudan has tried to illegally tap oil pipelines as a means to improve its national budget. The issue concerning perspectives for the future re-emerges, when some of the proposed resolutions include that South Sudan should make payments to Sudan for previous and future oil exports. The pressing question is where the money will go. Will it be used to purchase new weapons and armour from overseas? Yes - which is why it would make sense to combine the debt relief process with some sort of monitoring system that can determine precisely where these arms supplies come from. Thereby, one could ensure that new influx of cash will not be used to boost the arms trade. Considering the catastrophic social and humanitarian situation in both countries, it is simply unacceptable that 60-70% of the national budget is spent on security. Moreover, there is growing frustration among the people of South Sudan, who ask themselves whether their secession and independence have borne fruit at all. The politicians of both states should take this problem very seriously- or else the gap between them and the people will grow further. The Sudanese government is systematically blocking aid efforts to South Kordofan and the Nuba mountains. This intensifies the conflict. In Sudan, humanitarian aid is used as a tool of war. The signing of an international aid agreement is simply being refused. This is a highly complex situation, and it is most unfortunate to see how little the fighting parties actually care about the safety of those, who they claim to defend. At the moment, providing aid relief to the affected regions remains an incredibly difficult task. 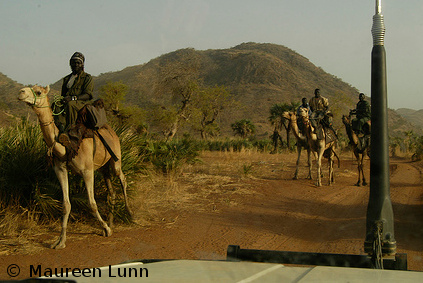 Many aid agencies cross over the “green border” from South Sudan into the South Kordofan province illegally. We would like to see a legalisation of aid provision, because the illegal option is strenuous and dangerous. How would you describe the state of NGOs in the region, for example, that of the Satellite Sentinel Project? National NGOs face extreme difficulties to set up in the first place, because they are dealing with a highly repressive regime that is not afraid to control peace activists in Khartoum, Darfur and Sudan’s East by means of brutal repression tactics. The international community should be more concerned and challenge the imprisonment of activists. The international NGOs’ capacity to act is very limited by their working under the constant threat of being deported. At the moment, their main task is to document what is going on. This is of great importance, because the situation in Sudan tends to be portrayed less alarming than it really is. Only once both the media and we abroad know more facts about human rights violations occurring in Sudan, are we able to appeal to the public in a credible fashion. Therefore, projects such as the SSP are extremely important. Are Sudan Conferences really an effective tool in trying to encourage dialogue between representatives of the Sudanese government and the SPLM-North? As far as the SPLM-North is concerned, we see few options that would lead to a permanent and goal-orientated dialogue between the two parties. Unfortunately, there aren’t many areas, in which rapprochement seems likely. It all comes down to the question of existence and which side will prevail. This is what lies at the heart of this problem, and what makes it so difficult to even find the slightest compromise. If one calls for the elimination of the opposing side, there can’t be any dialogue. * The 25th Sudan Conference took place from the 31st of October until the 2nd of November 2012 in Hermannsburg, Niedersachsen. Leading figures from Sudan and South Sudan attended the conference in order to exchange different views and to discuss strategies that would create the necessary prerequisites for a lasting peace.